Seigo Asada is the latest big name Asian star to join Unicorn as the company continues its expansion in the growing market of the Far East. 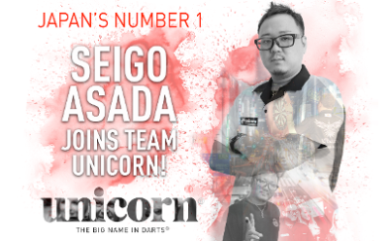 He is Japan’s No.1 soft-tip star and signs for Team Unicorn off the back of a battling World Championship performance. Big things are predicted and expected from Asada in the PDC. The 37-year-old from Osaka is known as ‘The Ninja’ and he won the Japanese Championship for a 4th consecutive year to earn his spot at the World Championship. Asada beat Australian Gordon Mathers in the Preliminary Round before losing to eventual winner Rob Cross. The score was 3-0 but that only tells half the story. He was edged out in last leg deciders in two of those sets with Asada pushing Cross all the way. Unicorn’s Edward and Richard Lowy are delighted to have Asada on board. Asada has played in the Japan Darts Masters, losing to new Unicorn stablemate Gary Anderson. He has also competed in the Lakeside Championship and has reached the last 16 of the World Masters. Watch this space for more information on the new range of Seigo Asada darts and equipment. WOW.. totally unexpected but Seigo is a great player. He will make great ambassador for Asia as he continues to take on everyone and show everyone how nice a guy he is too.